In public relations agency offices around the country, the time has come for a few annual rites of passage. Planning a holiday soiree, check! Buying client gifts, done! Sending end-of-year greetings or newsletter, got it! What remains? 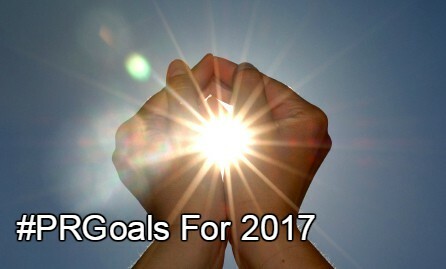 Besides tuning into Lee Daniels’ new series “Star” and getting the story on all the Golden Globes nominees, it’s time to set important, yet achievable, #PRGoals for 2017. We will enhance our video content and editing skills. The shift from text to multimedia content is one of the defining trends of modern PR practice. Video consumption has changed how organizations interact with their publics — four times as many consumers prefer digestible video content over text – and our data show that PR teams who don’t get their agencies and their clients on board will be behind the curve. We will grow our media relationships. Maintaining a great understanding of media wants and needs is a big part of securing meaningful coverage for a client. Of course, we bone up on what journalists cover by following them on Twitter and reading their stories. But it’s also helpful to go a step further by reaching out to share something unrelated to work as well as regularly interviewing them for informative blog posts like this. Relationship-building beyond incessant pitching can mean the difference between inclusion in a major story and remaining on the media sidelines. We will apply rigor to outcomes measurement. Although there will always be clients who want to know AVEs (advertising value equivalency) because it allows them to place a dollar value on the PR budget, there are better ways to measure the PR investment. And with the advent of online tools, it’s become easier to identify and quantify metrics of real importance to clients and agencies. The more we tailor analytics, the better PR’s value is proven. Newer tools also save time, allowing PRs to focus more on actual execution instead of generating huge reports. Smart measurement also helps identify both successes and failures, so you can repeat what’s working and pivot from what isn’t. The better able we are to show what our programs accomplish for the bottom line, the better situated we are to seek bigger budgets for the work we do. We will seek adequate budgets for the work we do. In 2014, the last year with available figures, 40 percent of public company respondents expected their PR/communication budgets to increase over the preceding year. In 2017, the competition for earned media coverage and share of social voice is only going to grow. Savvy marketers will need to increase PR spending to even stay at parity, let alone shine in their respective categories and tasking PR teams with social media is a smart way to increase results and ROI. We will double down on top talent. Whether you specialize in B2B tech or B2C PR, finding excellent employees is a constant challenge. Over 30% of executive say “lack of skills” and “lack of human resources” are holding them back from improving work quality. We say, let’s make the most of our engaging environment and eclectic client list and recruit aggressively and often to ensure a worthy pipeline at all times.